Percy Pratt was appointed greenkeeper at 26/- per week, he would go on to serve for over 40 years until 1949– his greenkeeping skills were pivotal in the success of the development of the course and he was presented with a plaque on his retirement. By 1920 it was argued in Council that Hollingbury was the best municipal course in England, this in large part must be testament to his dedication , skill & hardwork. 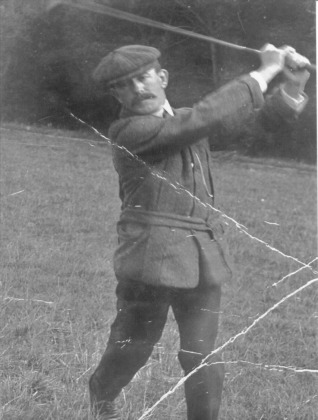 Golf professionals were not well regarded by ‘gentlemen amateurs’ regarded as just a rung up the ladder from caddies. A 1st class caddy could be had for 9d for 9 holes or 1s 3d for 18 holes, to include cleaning of equipment .There were strict rules for caddies that they ‘shall be decently clothed and strictly sober and conduct himself in a civil, respectful and proper manner. The Steward was appointed on a wage of 25/- a week.